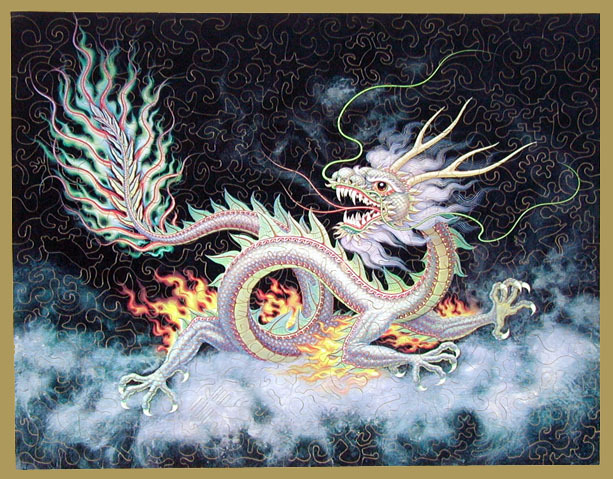 This is a puzzle made from the K. Chin's print, "Imperial Silver Dragon". For other K. Chin prints see: K. Chin - Prints. 1) The first puzzle where I populated the puzzle with so many "Concept Pieces". I have now decided to name the overall style the Creative style. Edit: In later years my Creative style became far more elaborate. 2) The first puzzle where my ideas for Flow Curl solidified as a distinct cutting style - appearing in several sections of the puzzle. Flow Curl gets its name from having a cutting line "Flow" or continue across a gap - showing up in one piece and then reappearing in another piece . The puzzle section shown is a good example. Edit: The Flow Curl concept became known as "Flow Cutting" as part of my Swirl Curl and particular my Creative styles, and not developed into particular style itself. 3) First Flow Curl "egg" piece. In the dark sky to the left of the TriStar figural. My next puzzle, #55, Sophia has 19 "egg" pieces. The "Observer" figural - woman in robe - is looking in the general direction of the "egg" piece. The Observer first showed up in Fantasy Faire - she may show up again in later puzzles. 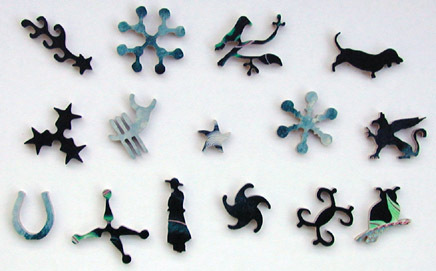 There are 14 figure pieces in the puzzle, all of them also appeared in Fantasy Faire.